The Green Bay Packers face the Arizona Cardinals on Saturday at University of Phoenix Stadium in the NFC divisional round of the playoffs. The opening line for this game has Arizona as 7.5 point favorites and the over/under was set at 50. Aaron Rodgers finished with 210 yards through the air for Green Bay in their 35-18 victory over Washington. He completed 21 passes out of 36 attempts for a 58% completion percentage. The Packers were led in rushing by Eddie Lacy, who finished with 63 yards on 12 rushes. He ended the contest with an average of 5 yards per carry. James Jones was the team leader in receiving with a total of 81 yards and 7 receptions. He finished the game with an average of 12 yards per reception. As a team in that game Green Bay had 346 total yards on 69 plays. They gained 11 rushing first downs, 11 passing, and 2 by way of penalty for a total of 24 first downs on the game. The Packers rushed for 141 yards by way of 32 carries. 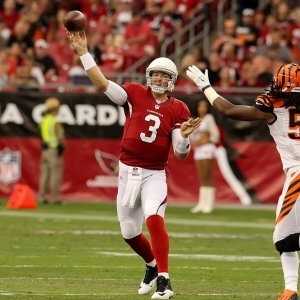 Carson Palmer finished his last game with 129 yards through the air for Arizona. He completed 12 passes out of 25 attempts for a 48% completion percentage. The Cardinals were led in rushing by David Johnson, who finished with 25 yards on 11 rushes. He ended the contest with an average of 2 yards per carry. Larry Fitzgerald was the team leader in receiving with a total of 55 yards and 6 receptions. He finished the game with an average of 9 yards per reception. Arizona had 232 total yards on 58 plays. They gained 0 rushing first downs, 13 passing, and 3 by way of penalty for a total of 16 first downs on the game. The Cardinals rushed for 27 yards by way of 13 carries. Green Bay is scoring 23 points per game on offense this season. In the passing department, they are averaging 22 passes on 36 attempts for a 61% percent completion percentage this season. They throw for a total of 219 yards per game through the air as well. The Packers are running for an average of 116 yards per game on 27 attempts for an average of 4.3 yards per carry. They are also running 66 plays per game and average 5.1 yards per play for an average of 335 yards per contest. The Packers manage 66 first downs per contest and they average a total of 54.6 penalty yards on 6.4 penalties. Green Bay allows 228 passing yards per game and 20 points per contest on defense. They give up 20 completions on 34 attempts per game for a completion percentage of 59%. The Packers allow 119 rushing yards per game on 26 carries for a 4.6 average per play. Green Bay gives up 347 total yards per game including 5.5 yards per play. They force 1.4 turnovers per contest and get flagged for 7.5 penalties per game that total 68.4 yards as a unit. Arizona averages 31 points per game this season on offense. In the passing department, they complete 22 passes per game on 35 attempts for a 63% percent completion percentage. They are throwing for 289 yards through the air per game thus far. The Cardinals run for an average of 120 yards per game on 28 attempts for an average of 4.3 yards per carry this season. They also run 65 plays per game and average 6.3 yards per play for an average of 408 yards in each contest. The Cardinals are gaining 65 first downs per contest and they average 47.4 penalty yards on 5.9 penalties per game. Arizona allows an average of 230 passing yards and 20 points per contest. They give up 21 completions on 36 attempts for a completion percentage of 58% per game. The Cardinals allow 91 rushing yards per contest on 23 carries for a 4 average per rush. Arizona gives up 322 total yards per game including an average of 5.2 per play. They create an average of 2.1 turnovers per game and 8.1 penalties for 75.1 yards each game.